To survive in this environment where change is the new norm, competitive organizations need leaders who inspire and support creative thinkers and flexible problem solvers! There are problems to solve, programs to develop, and innovation to drive business growth — all of which requires a team able to think on their feet and be engaged in advancing the organization’s mission. While there is no magic formula that insures people will exercise creative or critical thinking, there are ways to influence it. Here are a few of my recommendations. Manage your behavior. Are you more “problem-focused” or “opportunity-focused?” Do you tend to refer to the situation as a “problem” or an “opportunity?” Do you get upset and show frustration when a problem occurs? When leaders constantly view problems as a nuisance, source of frustration, or a threat, their behavior tends to project fear and anxiety into people. We cannot be our creative and innovative best — in Maslow’s words, “something more than people” — when we operate out of fear. [tweet_box]Great leaders tend to look at problems as “opportunities.”[/tweet_box] Opportunities to create and improve the organization’s products and services. This type of mindset inspires excitement and hope and influences the way your team members view problems. Set proper expectations. Completed Staff Work is a management principle adopted by the military during World War II. It is an important concept that promotes creative, solution-focused thinking, accountability and responsibility. I love this concept because before you go to your Superior Officer with a problem, you are expected to provide a full and concise analysis of the situation, three viable options, and a personal recommendation of the best option. The Senior Officer simply has to listen and either approve their decision or raise a question in any area their experience tells them something is missing. Personally, I think this concept is BRILLIANT and have used it in leading several of my teams. It truly will shift the mindset of your team from being problem-centered to solution-focused. In the spirit of the Disney hit movie Frozen … LET IT GO! Let go of trying to micromanage every detail. [tweet_dis]Micromanaging literally suffocates creativity and is the death of innovation. 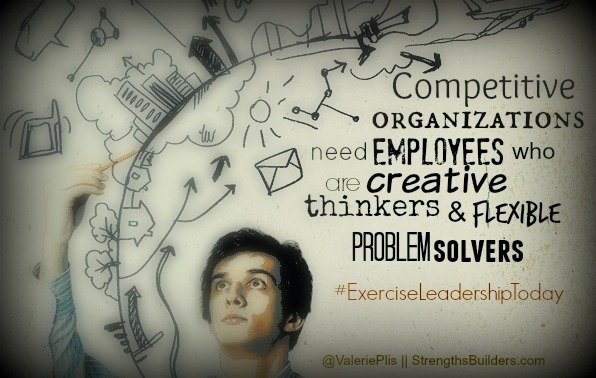 [/tweet_dis] If you want your team to start thinking creatively … you have to let it go! Take time to recognize and celebrate successes. When someone exercises creative thinking and solves a problem, take time to recognize it. Say something to them personally, recognize them in front of the team, write it in an email, or send them a handwritten note. The possibilities are endless, but powerful. Recognizing good or average performance makes recognition meaningless. So get clear, in advance, on what types of solutions deserve special recognition and then … celebrate the success! #ExerciseLeadershipToday Challenge: Where will you begin? What can you do today to move the needle towards a team that is thinking critically and creatively and is focused on developing powerful solutions?